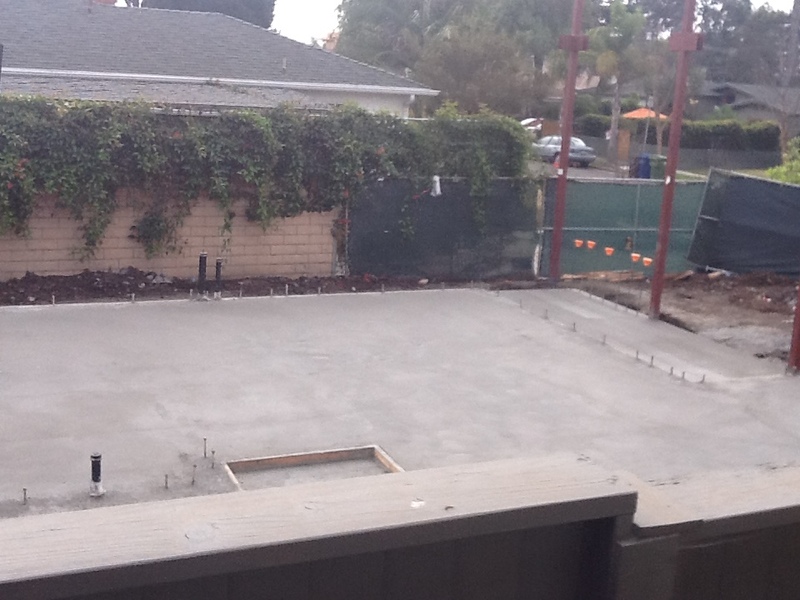 California houses typically don’t have basements. For an upstate NY transplant it’s a culture shock to pay such an insane amount of money for a house with a musty, web-filled dirt crawl space or concrete slab instead of a basement. Where basements are the norm the extra space is utilized for everything imaginable in addition to the typical laundry and storage areas, like play rooms, weight rooms, arts and crafts, game rooms, bars, man caves, family rooms, wine cellars, band practice, extra bedrooms, bathrooms, and more. Lack of a basement means having to convert the garage which is common. Foundations with crawl spaces are cheaper, but installing a vapor barrier over the dirt is recommended to keep out the moist, musty air. Alternatively concrete slab foundations are more common nowadays. There have been three recent tear-downs in the neighborhood, all with slab foundations. It was interesting to see this construction site progress.